Combining a love of the Hot Rodding culture and Volkswagens has resulted in a truly unique 1956 Oval Kustom. A Bug that incorporates the Porsche Outlaw ethos to add attitude and a classic racecar feel. When VW specialist Kieft en Klok are given carte blanche, the results are something very special. What could be better than finding a true survivor then making it your own? This is one cool Bus! Denim trimmed Special Edition from Mexico made all the more special by an owner on a mission. The amazing story of Filip Garsbeke’s 22 year quest to track down a mythical Barndoor hidden from the world for decades. The Ardennes Offensive, well not quite, but this is one of the most insane VW Bus gatherings of all. Under the blues sky of Barcelona the Bus festival attracts owners from all over Europe, and for good reasons. 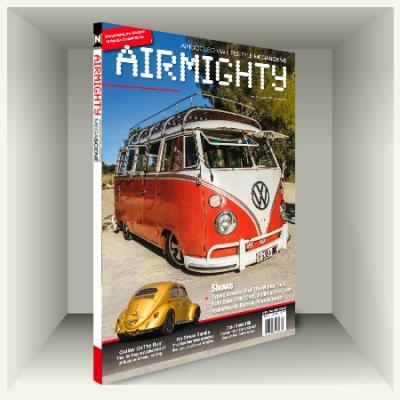 An open invitation to our VW friends to help us celebrate our 6th Birthday at AirMighty’s home in The Netherlands. Atruly fabulous location makes this the perfect celebration of the Type 2 Split Screen Bus. The Brazilian VW gathering offering peace, relaxation, and companionship. And very cool cars! With 145 classic Air-Cooled VWs together in convoy, our annual cruise is a truly amazing spectacle. The 19th year the sleepy town of Ninove, Belgium has been invaded by VWs. 1200+ cars filled every street. The premier event held in the UK and the show the new cars are seen for the first time. It always delivers!